For those that don't know him, he is the absolute best pitcher on the planet. And, that is not an opinion. At age 28, he has won three Cy Young awards, given to the best pitcher in each league, leads the league in strikeouts, era, complete games. Basically, he is the best of the best. So often in life we admire leaders and high performers and think, wow, they are just so talented. It must be in their genes. It's not our fault, after all, we didn't notice Clayton Kershaw when he was 16 years old, eating, sleeping and drinking baseball. We didn't notice Steve Jobs when he was sitting in his parent's garage in Palo Alto, California trying to make something. We noticed them after they arrived and after they put in their 10,000 hours. The thing that is fascinating about Clayton Kershaw, and that is most important to learn from his example, is that the best of the best, don't just rely on talent and charisma once they get there. 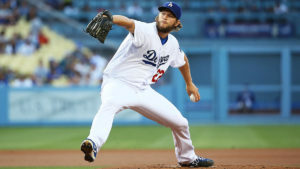 We see Clayton Kershaw pitch every fifth day, for 4 months in the summer, what we don't see is that he has planned out every other aspect of time he is not pitching. His entire life is oriented around being an excellent pitcher for two hours, every fifth day. To see some of the insanity of his routine, check out this article from ESPN.com. The learning is, in Baseball or in Business, it's not an accident that you show up and perform well. Great business leaders and high performing athletes, have created a habit of giving themselves exactly what they need in order to show up at their highest and best self to perform their job. For some people, like Clayton Kershaw, it's a strict 5 day cycle of routine when he's pitching down to the shorts he wears on game day. For Steve Jobs, it's things like wearing the same black turtleneck and blue jeans so he no longer had to spend energy on deciding what to wear. For me, it's often getting my favorite coffee in the morning, walking my dog and listening to an inspiring podcast. What is it for you? What are the habits or routines that would have you showing up at peak purpose and effectiveness when it matters?